Hello ladies! I am starting off this week with a small but happy post! I have been blogging about nail polish for over four years and had yet to try out gel polish. Honest to goodness it just intimidated me. I have worked so hard to get to my nails as strong and healthy as they are and I was afraid that if I didn't know what I was doing with gel polish that I would mess them up. I am so happy to report that my first experience was really successful! Hello lovelies! Today I'm reviewing three of the new Powder Perfect stamping plates. I am super impressed by the variety and quality of design in all three. I especially like the originality of the Kings and Castles plate, I don't have anything like it. If you haven't seen my Four Year Blogiversary Epic Giveaway yet, two of these plates are actually part of the prize! Let's take a look.. I started compiling this list a couple weeks ago but it's taken until now to finish it. My original plan was to do a list of my top eight post from the last four years. I browsed through all 590 post I've done so far and came up with over 50. I worked on whittling it down as much as possible and finally settled on my favorite 16 instead. Even that was next to impossible so I fudged a little with some "honorable mentions" at the end. I hope you enjoy this stroll down memory lane! Hello my wonderful Society Sisters! I am so excited about today's post because I finally get to show off this collection I've been collaborating on with Colores de Carol! Born from my affinity for brown polish, I had made the suggestion of a holographic collection that was all neutral. The lovely and talented Carolina ran with it and came up with eight gorgeous shimmery, holographic, creme shades. Then I did my thing (my favorite hobby inside of a hobby) and came up with all the names. I wanted to come up with a theme that fit the mood of all the shades and tied them together. The soft, neutral color palette exuded a sort of intangible feeling of intimacy and romance. The stream of consciousness flowed as I envisioned a sensuous laid-back woman; beauty that comes from a quiet confidence; those sophisticated Parisian women with a certain.. je ne sais quoi. And so the Romantique theme was imagined with French derived names that I feel fit each shade very nicely. Let's take a look..
Hello lovelies! Today's review is full of fruity Summer yumminess. I seriously smell like fruit cocktail right now and it's delicious! If you like fruity scents and hand/nail/body care products, you can't pass this one up! Hello lovelies! I have a beautifully bright and colorful post for you today! The KBShimmer Summer Vacation collection consists of eight shimmery shades full of special "holo glow" flakes. I photographed my swatches under artificial light which always kills the holo sparkle, but in person they are all very sparkly. The formulas were all great and applied nice and smooth, except for one which dried down a little bumpy. They were also all two coaters except for the yellow, which is no surprise for that color. Is your interest piqued? 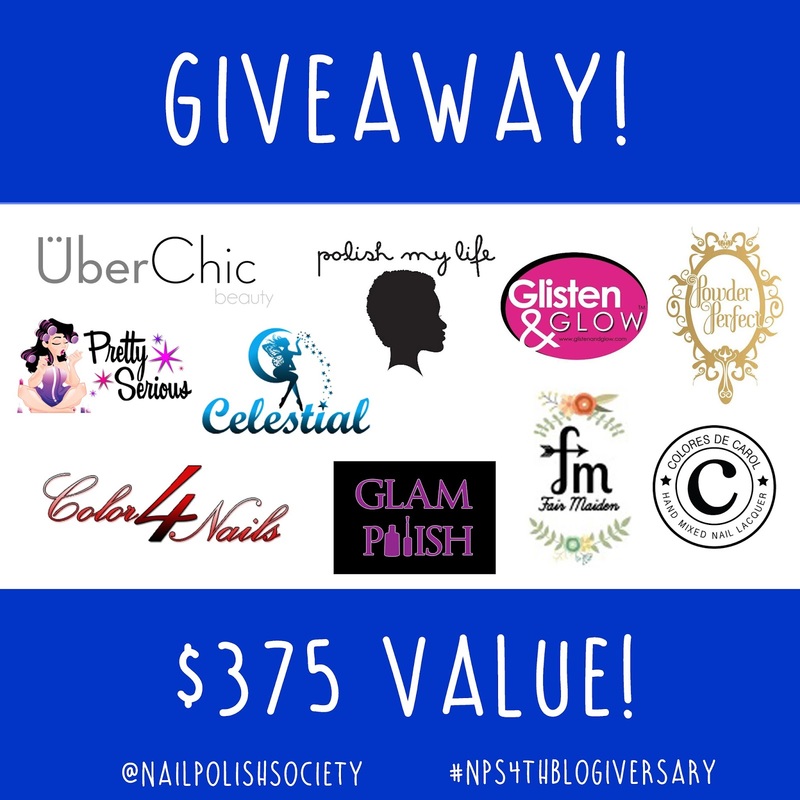 Let's take a look..
Four Year Blogiversary Epic Giveaway! 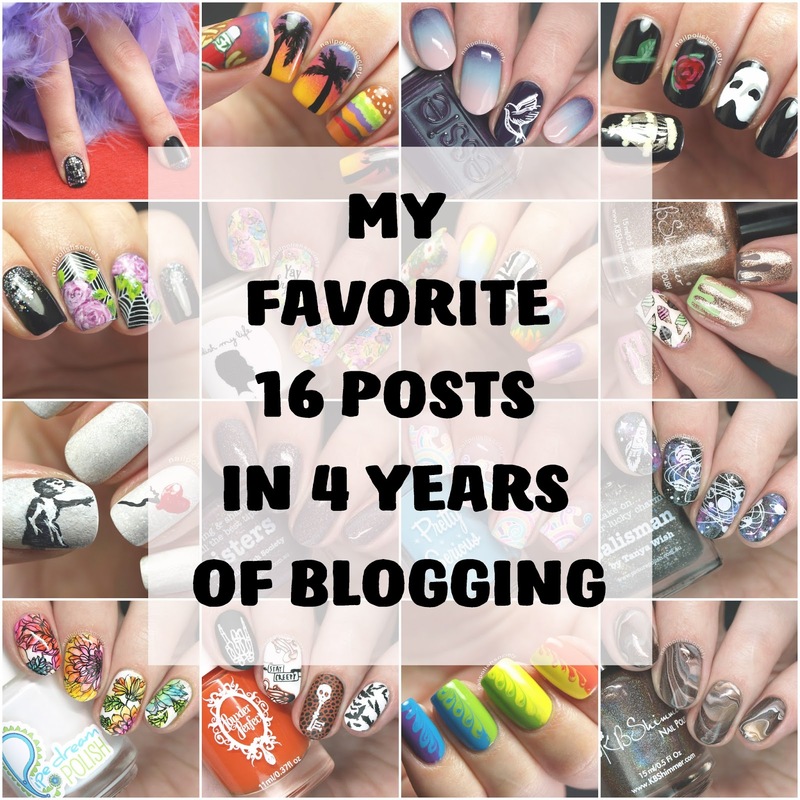 I can't believe it's been another year and I'm still loving this blogging thing! To celebrate I've put together a YUUUGE giveaway. I asked some of my favorite brands if they'd like to participate and they have been super generous. I think you'll agree that this is one amazing prize! Aloha! I have five festive glitter toppers from Colores de Carol to share with you today! The two shades with smaller glitters were the easiest to apply, and the ones with larger glitters take a little more care in application. I really like the combo of colors and especially the micro holographic glitter that my camera struggled capturing. Let's take a look..
Hello lovelies! My nail length still isn't back to where I'd like but I couldn't wait any longer to swatch this COTM (color of the month) duo from Girly Bits. I was generously sent these two beauties because I named one of them (you know naming is my jam)! Let's get to it..
Hey friends! It's been a few day since I last posted because I suffered a tragic break on two of my nails :(. Other than that things have been good, I've just been impatient to get back to my reviews! Today's post is a review of four Cici & Sisi stamping plates and a clear stamper. These are different than any other plates I own because they're actually plastic instead of metal! There were some really great designs in these plates but I did feel like it was harder for me to get really crisp lines. I'd love to know if you can see a difference. Let's take a look..